I primarily do plain, wholemeal breads, rather than sweet breakfast pastries, but Carla's parent's were coming up and I wanted to have something sweet to have with coffee in the morning. I found this recipe in one of my books (although now I cannot remember which one), which caught my eye for both its unique ingredients and unusual and appealing look. The author said it used to be known as a "race track cake," in reference to the wiggling, repeating figure 8 shape of the cake. This is basically a recipe for a sweet roll-up type bread, like poppy seed roll or cinnamon buns. But after filling and rolling the dough, you cut the bread, about two-thirds of the way through, every 1" or so down the length of the roll. Then you flip every other roll back over itself, so you have buns kitty corner to each other, but still connected by a central line of dough. This give each segment room to rise and expand, but also gives the roll an almost braided look. The filling caught my eye as well, as it was a blend of cream cheese and pistachios. While it was a good combination, I didn't actually think it elevated the cake (or justified the cost of the pistachios). Anything with pistachios (as least to me) has an inherent charm, but blended with the cream cheese they lose what makes them distinctive. 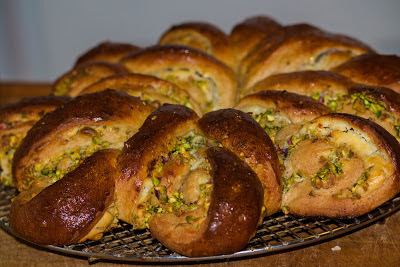 As the dough goes through its second rise, the cream cheese makes the pistachios soft. So they're not particularly crunchy, and the rich cheese seemed to give the nuts a muted flavor. Perhaps next time I'll go with something sturdier, like walnuts or almonds, and keep the pistachios as a topping or garnish.